Makalu Summit Attempt Aborted – jet stream winds…! After over a week of patient waiting, eating, sleeping, staring at the summit and meticulously preparing for the ultimate challenge of summitting this absolutely stunningn mountain, we’ve had to now accept one of the variables of mountaineering - despite the time and money spent, effort expended and summit dreams envisaged, that there is little that can be done to control the weather. Adrian, Chad and Monica have been fastidiously poring over our daily weather forecasts, agonising and longing to deliver some ‘good news’ - that there has been a break in the jet stream winds (the allusive ‘weather window’), but we have finally been forced to accept what has there will be no remission in the extreme winds at 8500m for at least the next two weeks; and beyond that, all there is uncertainty… it’s been an unusual season in the Himalaya and, looking at the forecast, it wouldn’t surprise me if there were no Himalaya 8000m summits this year. We get our forecasts from a specialist team of expert Himalayan meteorologists in Bern called Meteotest. They have assured us that as far as their forecasting can predict, the winds at the summit of Makalu will be 80-100km/hr, with gusts in excess of that for the foreseeable future. Temperatures are dropping and there is no sign that the jet stream will shift off the Himalaya any time in the next two or three weeks. Obviously we are disappointed but finding comfort in the fact that there is little you can do about the weather..! We are strong, healthy and have performed exceptionally well on the mountain and have taken advantage of the perfect conditions and route. Having said that, trying to climb above 8000m is something that pushes the physiological, psychological and emotional boundaries of every climber, even in the most perfect weather conditions. Trying to do so in 80km/hr winds with windchill temperatures approaching the -40's, is foolish to say the least. There is no way to justify an attempt at the summit in such adverse conditions. The risk of frostbite, accidents and even death is huge, and in no way a risk we are prepared to take. I value my fingers and toes too much! So it is with great sadness that today we made the decision to turn our energies to cleaning the mountain, breaking down high camps, bringing down unused oxygen bottles and tents, and leaving here within our scheduled dates. Having said all of that, and in spite of the disappointment, I've had an absolutely INCREDIBLE expedition and am so happy that I took the chance in attempting to climb Makalu. I've learned heaps, have met a wonderful group of people, took a risk both with the mountain and the weather but it didn't quite work out.... this time! I know for a fact that I will be back next year and will attempt in the Autumn once again. I knew when I decided to join the expedition to climb Makalu that the timing of climbing 8000m peaks in the autumn is not easy. The season begins before the monsoon is over and the early weeks are overshadowed by difficult decisions regarding snow safety (as was so tragically illustrated by this year's avalanche on Manaslu). There is then usually (!) a short period at the beginning of October when the weather allows climbers to make their summit attempts. 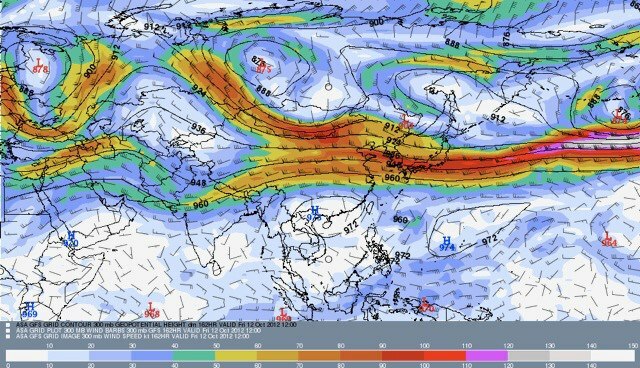 This period is rapidly shut down as the jet stream moves south onto the Himalaya and generates wind speeds well in excess of what it is possible to climb safely in. This year, that small window of windless days came at the end of September and, rather than offering another few days later in the first two weeks of October, it has been slammed shut by a ferocious jet stream that is sitting firmly above Nepal generating serious winds across the mountains....and showing no intention of shifting at all. There is little we can do apart from sit in our comfy base camp and stare at the summit where the wind tears at the Makalu La. We had everything in position for a solid summit attempt. The team was well acclimatised and well rested. The Sherpa were ready to go forth and fix the route to the summit of yet another of Nepal's giants. Equipment at our various high camps was in position and accounted for. The conditions underfoot on the mountain were unbelievably good. Yet, the final piece of the puzzle is just not going to fit...and in this game, if things don't fit perfectly there is simply too much to lose. Tomorrow we’ll make our way back up to 6800m to collect our personal equipment. The Sherpa will take two days to bring down everything that is on the mountain and after that we will break down ABC and head down valley to catch our helis (weather permitting!) to Kathmandu on the 11th. The map with the pretty colors is a world map (as shown above) and the colors represent different wind speeds at 9500m. The easiest way to find us is to find the outline of India and then above it the outline of Nepal. We are in the eastern half of Nepal, under the yellow/brown color which represents winds of 60-70 knots. All the jet maps we have looked at look the same or worse. Depressing! 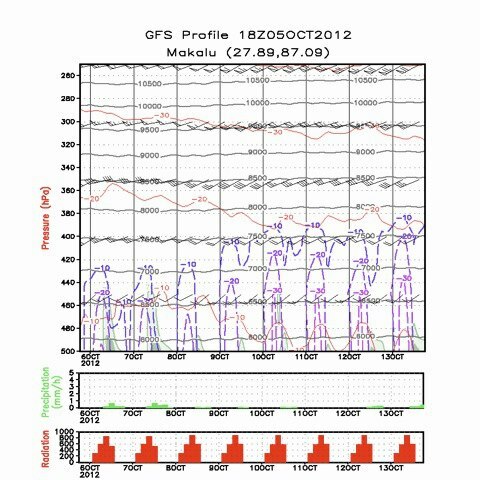 The GFS profile (below) is a little more specific to the altitudes we are dealing with. When we're looking for a summit day we chose the 8500m altitude line (360hPa) and then look at the wind flags (the lines with hashes). The long line shows the direction of the wind, the hashes each represent 10 knots of wind, so on this chart, as you can see, the wind at 8500m does not drop below 35knots throughout the whole of the period shown.